It's just a job - LIVES medic Chris Coles behind the wheel of his emergency vehicle. Three weeks ago, there was a fatal incident in Horncastle, I should know. I was there. I recognised the person involved, I’d been talking to him minutes before. I’ve got to admit, I was a coward. I didn’t have the ‘bottle’ to walk across the road to where the incident had taken place. Chris Cole didn’t have any choice. He’s a medic with LIVES. 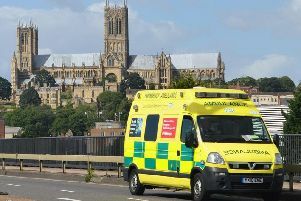 Latest figures show LIVES are more likely to be the first on the scene of an incident in Lincolnshire than an ambulance crew. That’s not a slight on the East Midlands Ambulance Service. Their crews do a fantastic job, Chris Cole knows that. He’s also paramedic with EMAS. Given his duties with LIVES, doesn’t that make him something of a glutton for punishment? A wry smile lights Chris’s face as he ponders the question. To him, saving lives is a job, a very special job, a very brave job. Not that he’s in it for thanks or adulation. “In fact, some of the most rewarding jobs aren’t when you’ve saved someone’s life. “It could be you’ve spent 20 minutes with a patient, provided re-assurance and made sure that although they might be having the worst day of their life, we’ve filled a gap and helped them get to the next point of care. “It might be pain relief for someone who has broken a leg. “They’re frightened. They’re upset. You’ve got to manage the situation and say whatever they’ve done, no matter how horrible it might seem, then it isn’t as bad as it was. LIVES is a charity and relies on an army of fundraisers - and volunteer responders and medics like Chris. He was born in Louth and attended Cordeaux High School. He worked all over the country before returning to Lincolnshire. He lives in Humberstone and is stationed in Mablethorpe with EMAS. Chris has worked with EMAS for 14 months and has served as a medic with LIVES for two years. Previously, he’d worked in the civil service as was a reservist in the RAF. A mid-life crisis promoted a change in direction. He became a first responder with LIVES in 2009 and then trained with the Yorkshire Ambulance Service before moving to EMAS. When Chris’s phone rings - or bleeps with a text message - he has no idea what the situation might be. He attended five serious incidents in January. February was quieter. Not that you’ll find him using that particular word. Apparently, superstitious paramedics learn pretty quickly not to say the ‘Q’ word. He said: “I can still recall my first call as a first responder. It was a patient choking. It turned into just providing re-assurance and waiting for the ambulance crew to get there. Gruesome scenes are, unfortunately, part of the job. “You never get used to it,” admitted Chris, slowly taking a sip from a mug of coffee. “You learn to manage it in your head. “Listen, we all do what we do - save lives. “If I freeze and stop and don’t deliver my skills and care, that patient potentially isn’t going to live. “It comes down to wanting to get the job done. “That’s not to say we don’t think about it afterwards, but there’s good support here (at LIVES). “After a serious incident, we have a de-brief. After serious incidents - Chris can’t talk about specific cases - emergency crews meet to discuss whether they could have done anything different. Chris added: “That does help, but there is always an element of having to go away and think about it on your own. “You come to terms with it in your own way. Chris doesn’t count the hours he’s on call. He admits he sometimes says no - more often than not because he’s too far away from incidents. His ‘day job’ means he often works beyond his contracted hours. Ambulance crews work 12-hour shifts. If they are dealing with an emergency at the end of the shift, they can hardly pack their bags and go home. Chris explained: “I try and manage my LIVES commitments on my terms. “If I’m between two shifts with EMAS, it’s unlikely I’d go out, but that said, if something serious came in I may offer my services - if it’s appropriate. Somehow, Chris fits hobbies like sailing, walking and DIY into his busy schedule. He also helps out with local Scouts and Guides groups. Training is on-going. “There’s always something to learn, something you can improve on,” he said. Chris is helping to train first responders. He also hopes his story will inspire others to join the organisation. He added: “The county would be poorer without LIVES. No ambulance service in the country would be able to put an ambulance on every street corner. “To be able to have local volunteers on duty is vital. “Very often, you can be helping friends neighbours. “I’ve met some fantastic people through LIVES and Lincolnshire really is a jewel in the crown of first responder schemes. n Anyone interested in volunteering or helping raise funds for LIVES can get information from www.lives.org.uk or 01507 525999.